Tucked away in gorgeous Southern California wine country, Murrieta, California, is an excellent city in which to live. With its close proximity to fun entertainment options, wonderful weather, and friendly residents, it is no wonder that this amazing community is one of the fastest-growing cities in California. Murrieta real estate remains reasonable, and with all the beautiful Murrieta homes for sale, now is the time to become a resident of this fantastic city in Riverside County, California. Murrieta’s location is very convenient, particularly for those who work in San Diego County, Orange County, Los Angeles County, Camp Pendleton, or Temecula. These neighbors of gorgeous Murrieta also provide opportunities for a fun weekend getaway, and with such a wide variety of interesting destinations, you will never be bored. Additionally, many of the fun destinations surrounding the city are very close and easily accessible. For example, Temecula is less than ten miles away, and the cities capitalize on this fact by hosting an annual joint hot rod vintage car show. Furthermore, Temecula is home to Temecula Valley Wine Country, which, as the name implies, is full of picturesque wineries. Nearby Lake Skinner is the perfect setting for a picnic lunch, and boating and hiking opportunities abound in the area. Regardless, you won’t have to leave exciting Murrieta to find something to do! For kids, and adults who are kids at heart, the Mulligan Family Fun Center offers go-kart races, miniature golf, laser tag, and more! If you prefer enjoying the beautiful weather outside, the Santa Rosa Plateau will become one of your favorite places. This ecological reserve located just past the western border of Murrieta allows visitors to view endangered wildlife and plants, including the impressive Engelmann oak. This ecological reserve is emblematic of the astounding natural beauty of this city—a beauty that continues to enchant its residents. Investing in Murrieta real estate is a wise decision, and its central location and incredible scenery have already drawn many new residents. Affordable Murrieta homes are waiting for you as well. Homes for sale in Murrieta come in a broad price range and include properties of various styles, ages, and sizes. Consider a majestic yet affordable single-family Murrieta home or a modern Murrieta townhome or condo. Whatever you are in the market for, you will find it in this remarkable city. 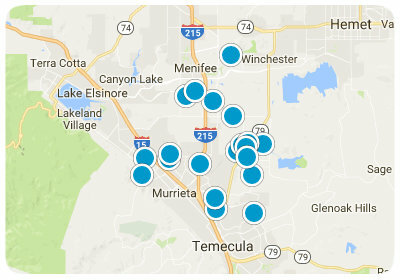 If you would like more information about Murrieta, California, real estate, please do not hesitate to contact us! Come see firsthand why Murrieta is one of the fastest-growing cities in the state!